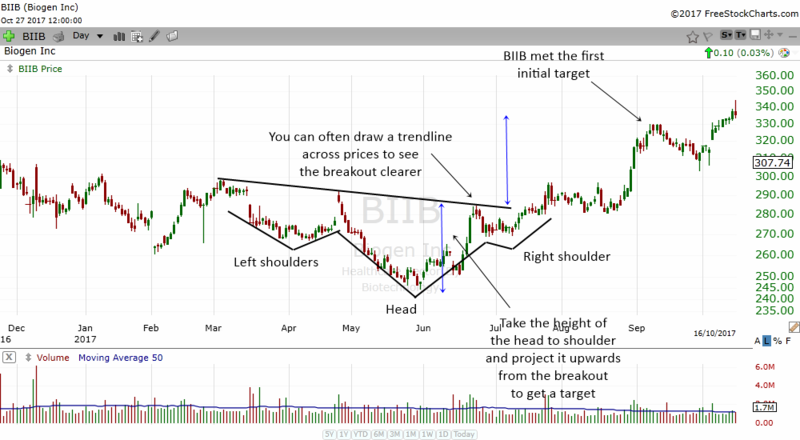 The reverse head and shoulders pattern is a bullish pattern that tells us that a stock is bottoming and is likely to move higher in the future. This pattern is the opposite of the head and shoulders pattern which warns of a top. 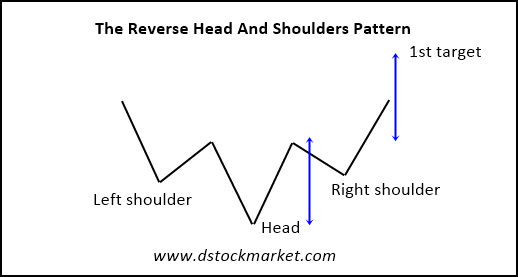 Where the head and shoulders pattern is a topping pattern, the reverse head and shoulders can often end the correction or bear market in the stock. I'm sure you have seen a head and shoulders right? When you look at the mirror everyday or when you look at your spouse, you will see a head and two shoulders. That is where the name of this pattern comes from. The reverse head and shoulder pattern is what the name implies. You will have a first low (left shoulder), then a lower low (head) and then a higher low (right shoulder). The diagram above shows how the reverse head and shoulders look like. The right shoulder and left shoulder will be about the same level with the head forming a lower low. The moment the stock trades above the shoulders (neck area), we can assume that the reverse head and shoulders pattern is already forming. Some traders may even start to take a position in the stock when that happens. Did you know that this chart pattern can enable the trader to set a price target? Well at least it will give us an initial target for our reference point. Many times, the stock might just continue to move higher. Especially if after the pattern forms, the stock starts a new uptrend, the stock will no doubt continue to rise higher and higher. But for now, let us see how the reverse head and shoulders pattern can help us set a target. To get an initial target for this pattern, take the height of the head to the neck and project it upwards from the point where the stock breaks above the neck of the pattern. The diagram above shows two blue arrows. The bottom blue arrows is the height of the head to neck and the second arrows shows the initial 1st target. Let's take a look at some real examples of the reverse head and shoulders below. It takes a bit of practice to be able to spot this pattern as it it developing. In hindsight, it is easy to see this pattern. But when the pattern is forming, it can be a bit hard to spot unless you are already expecting it. 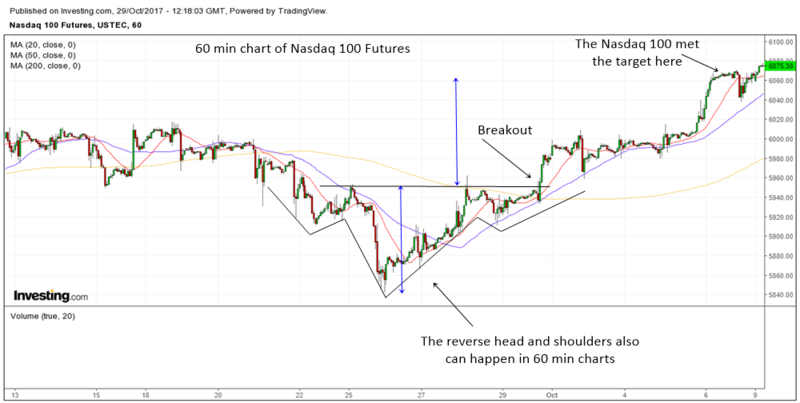 Normally, traders will begin to suspect that the stock is forming a reverse head and shoulders when they see a left shoulder and then a head and then the stock correcting to the area of the left shoulder. At this moment, the right shoulder has not fully formed yet. Traders can anticipate a rebound near the area of the left shoulder. If the stock stops correcting at this area, then a reverse head and shoulders is very likely to form. The chart above is the daily chart of BIIB a biotechnology company. The reverse head and shoulders pattern in this stock span quite a large area. The entire pattern developed from March 2017 to July 2017. Some reverse head and shoulders will form faster while some may form slower. In the case of BIIB it is slightly slower to form as it takes a few months. If you look at the chart of BIIB you will notice that BIIB formed the left shoulder in April 2017. It then had another downward movement which ended in late May which formed the head. The stock immediately rose from there but was unable to go any higher as it hit resistance. It corrected a bit to form the right hand shoulder. The trader can now draw a trendline that connects the highs of the 3 rallies. Some trendlines will be sloping downward and some trendlines will be flat. It all depends on the stock. Occasionally you will have a trendline that slopes upwards but that will be the rare occasion. The stock is considered to have broken out of the pattern when it trades above the downtrendline. You can take the height from the head to the shoulder (the neck's height) and project it upwards from the point where the stock breaks out from the trendline to get a target. BIIB achieved its initial target in early September. Traders who traded this pattern can take all of their positions off the table or they can sell 1/2 and keep the rest and see if the stock can move higher. The chart above is another reverse head and shoulders example in the daily chart. It is the chart of the S&P 500 Futures. The reverse head and shoulder pattern is known as a bullish reversal pattern and as you can see, it often ends a correction. In the chart above, the S&P 500 is in a long term uptrend. However, the ride up is not always smooth and there will be corrections here and there. The S&P 500 corrected in early August to late August 2017. During this period, the index formed a reverse head and shoulder pattern. 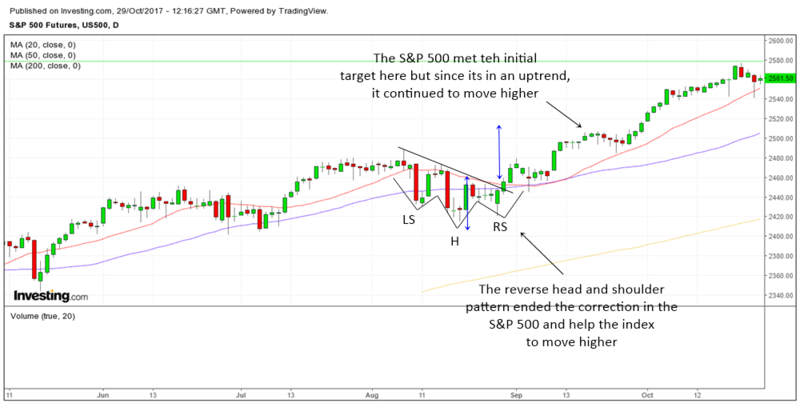 There were many volatile moves up and down but towards the end of that period, the astute trader will start to notice that the index may be forming a very nice reverse head and shoulders pattern. The index made a left shoulder, then a head and then a right shoulder where the index stop dropping near the area of the left shoulder. You can also draw a very nice downtrendline to watch for a breakout. The pattern is completed the moment it breaks out of the downtrendline. From there, you can take the height from the head to the shoulders and project it upwards from the breakout to get a price target. The S&P 500 index met the initial price target in mid September 2017. Notice how I always mention the price target as an "initial" target? That's because if the reverse head and shoulders pattern happen in a long term uptrend, there is a big possibility that the stock or index will continue to move higher even after the target is met. That is exactly what happened to the S&P 500 index. After meeting the target, it declined a bit. No doubt that many traders and investors also saw the price target and took some profits off the table. However, the index just drifted lazily downwards with no real intention of crashing lower. Then it found support near the previous highs and continued to march higher. That's the beauty of the reverse head and shoulders in a long term uptrend. You almost always can expect the index or stock to move higher after meeting the first target. If a chart pattern can appear in the daily chart, they will also tend to appear in many other different time frames. Let me just show you how versatile the reverse head and shoulders pattern can be. The beauty about learning chart patterns is if you master one, you are able to spot the same pattern again and again in different time frames. So, if you really wanted to, you can trade stocks in any time frame just using one chart pattern. The chart above is the 60 min chart of the Nasdaq 100 Futures. Notice the familiar pattern in the chart above? I did not lable the left shoulder, the head or the right shoulder. But a simple drawing enables traders to spot the pattern. The trendline at the neck is horizontal this time instead of sloping downwards. Notice how the index broke out of the trendline and then shot higher. It even met the target. Let's zoom into an intraday chart. This time it is the 5 min chart of SPY which is the etf that tracks the S&P 500 index. There is sufficient liquidity in many index etfs today and many traders trade these etfs instead of the main index. 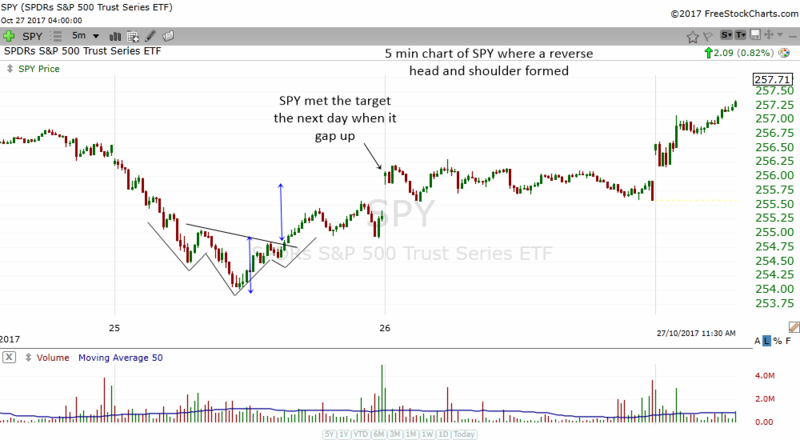 Notice how the SPY formed a 5 min reverse head and shoulders pattern. This time it had a downward sloping trendline. Although it did not hit the target on the same day, the next day the SPY gap up and met the initial target. By the 3rd day it had drifted even higher. Never underestimate the classic chart patterns such as the reverse head and shoulders. Many corrections and bear markets in indices and stocks end with this pattern. Many new uptrends and strong bull markets also appear after this pattern forms. If you learn this pattern well, you will be able to spot many bottoms in the future and profit from them.